Holocaust research is very important. Now more than ever. Facing and comprehending our shared history make people appreciate the importance of the European project. Every day thousands of researchers seek to get the full picture of this dark side of Europe’s recent past. These efforts need to be continued. 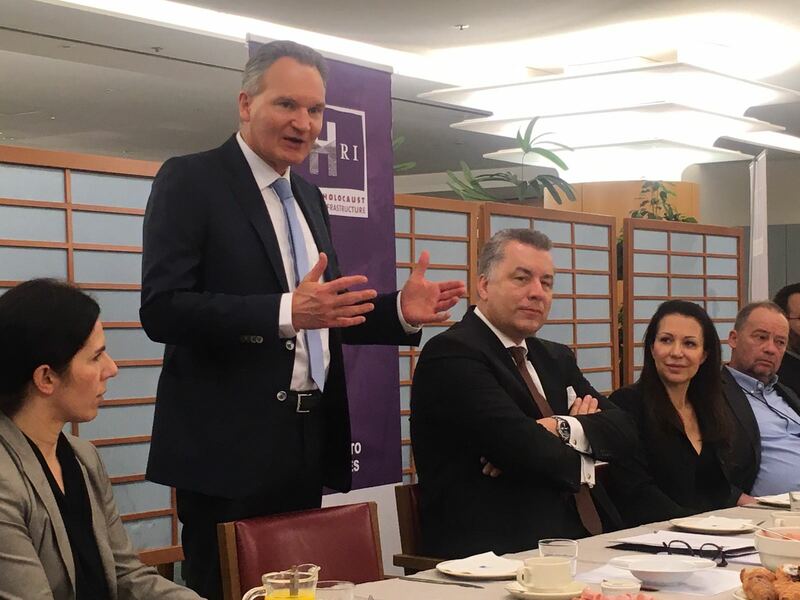 On 25 January, members of the European Parliament Jerzy Buzek and Christian Ehler, and Director General Research and Innovation Robert-Jan Smits on behalf of the European Commission, made this pledge during a breakfast meeting at the European Parliament, where EHRI presented itself. The meeting was held on the occasion of the commemoration of the Holocaust in the European Parliament. Jerzy Buzek - former Prime Minister of Poland and former President of the European Parliament - and Christian Ehler - Member of the European Parliament since 2004 - called for an active role of national governments of all EU member states in supporting both national and international Holocaust research. For a balanced and sustainable approach to the history of the Holocaust it is crucial to enhance connections with research communities in Eastern Europe and in countries with less focus on genocide studies. Documenting and comprehending the Holocaust does not become easier. Survivors who can testify are dwindling in number. Soon the time will come when we will be without anyone who can speak from direct experience. Therefore since 2010 the EU, in particular through the Research & Innovation Programme Horizon 2020, has supported the EHRI-project in building a European Holocaust Research Infrastructure. The resources and tools that EHRI is developing secure not only the future of Holocaust research, but also of commemoration and education. EHRI can never replace the survivors, but it can honour and remember them by continuing to improve access to Holocaust sources. In 2017 EHRI will present its plans for a permanent European Research Infrastructure. At this moment the interest for developing such an organisation is being inventorised among EU member states. Until now EHRI has stimulated and enabled researchers from Europe, Israel and the United States to join forces in a human network and a digital infrastructure. Currently the EHRI consortium consists of 24 partners in 15 countries across Europe and beyond. It is coordinated by NIOD Institute for War, Holocaust and Genocide Studies in Amsterdam. 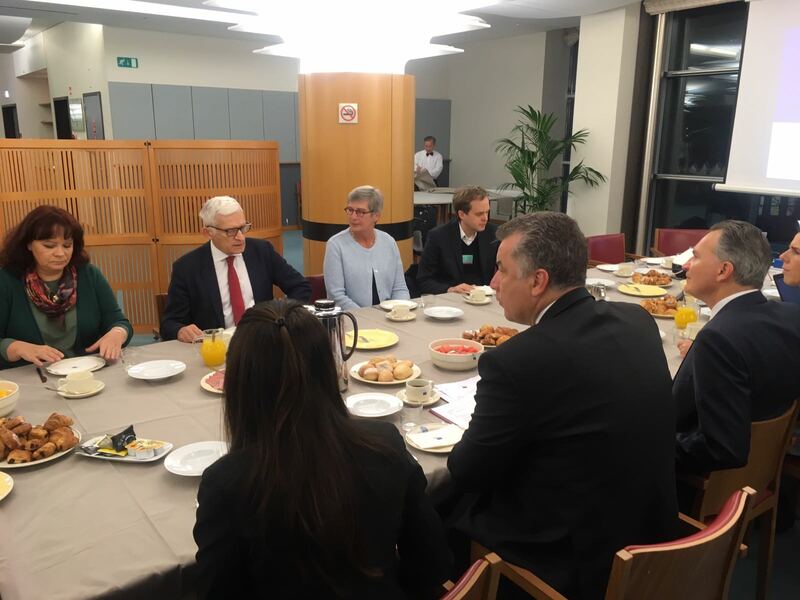 EHRI meeting with members of the EP. Christian Ehler speaks.